The Government Inspection Mark is required to be able to sell or trade portable fire extinguishers (up to 20 kg) in the Netherlands. This "quality mark" is indicated in an elliptical symbol printed on the label of a portable fire extinguisher. The European standard EN 50518 'Monitoring and Alarm Reporting Centres’ outlines requirements for the functional operations of Private Alarm Centres (PAC). Every fire protection and burglary security system comprises a number of components. However, a chain is as strong as its weakest link. This principle certainly applies to protection and security components. 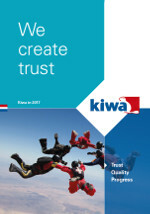 Kiwa NCP has therefore set up a registration system for all product certificates to provide assistance. The international standard ISO 28000 Specification for security management systems for the supply chain has been developed to provide a model for establishing, implementing, designing, monitoring, assessing, maintaining and improving a security management system.